Overall print size: approx: 18½" x 28" / 47 x 71cms. "Like many others, I have read and been moved Geoff Wellum’s gripping recollections as a young ‘boy’ pilot during the Battle of Britain". With this new painting I wanted to capture on canvas and in print, some of the atmosphere described so brilliantly in Geoff’s book, "First Light". Stephen Brown, artist. It is the winter of 1941 and heavy snow has disrupted operations for several days. A break in the weather today has brought blue skies and the opportunity for the ground crew to clear the runway of snow and get the pilots of 92 Squadron airborne. Flt. Lt. Geoffrey Wellum and his fellow fighter pilots are bringing their Spitfires safely home after the third and final sortie of the day. This edition is fully signed by the artist and Sqn. Ldr. Geoff Wellum DFC. 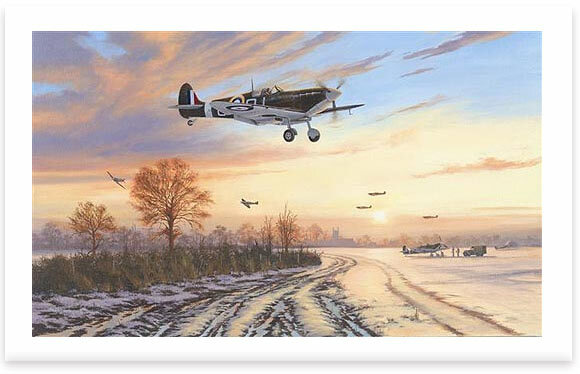 The Artist Proofs are also signed by Geoff’s Commanding Officer during part of his time with 92 Squadron, Group Captain Allan Wright DFC* AFC. Pilots signing "Spitfires Safely Home"
(L-R) Allan Wright, Bob Stanford-Tuck, Bob Holland.